Islamic fundamentalists in Pakistan are again expressing their moral outrage over the effort of the international community to vaccinate their children against polio. In the latest case, at least 12 security officials were killed and nine others injured in an ambush on a clearly marked medical convoy in the Jamrud area of the Khyber tribal region. It appears that both murder and denying children polio vaccines are viewed by these men as a pure expression of faith and morality. The militants hit the convoy with improvised explosive & devices (IEDs) and then racked the convoy with automatic fire. They then prevented the wounded from being removed for medical treatment. We previously discussed how the Taliban is opposing similar efforts violently in Afghanistan. 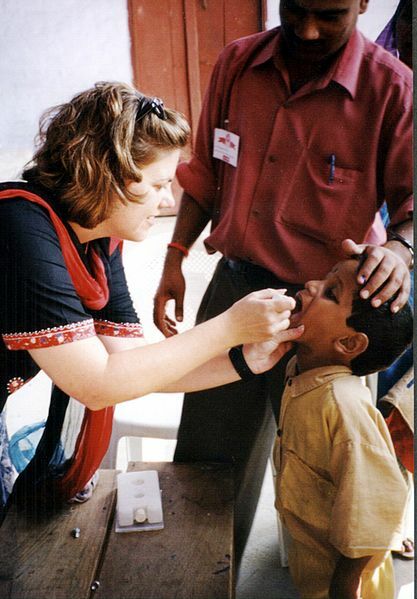 Polio is an epidemic in Pakistan by Islamic rebels have killed over 40 health care workers to prevent them from protecting children. The United States has been accused by some of responsibility for these attacks. The CIA used a fake polio vaccine program to hunt for Osama Bin Laden and obtain DNA from suspects. The attacks on health care workers sharply increased as a result with militants treating all such efforts as presumptive Western intelligence operations. The use of a health care program remains controversial. The use of reporters or health care professionals endangers thousands of people who should be treated as neutral parties in these disputes. This, of course, does not excuse these fanatics or justifies their actions. They continue to use religion as a rationalization for murder and other atrocities. Thus it is not surprising that they would use the Bin Laden raid in the same fashion. However, I would be interested to know if anyone at the CIA raised the danger to health care workers if they used the polio program as part of their operation. When you pull into the grocery store parking lot there likely be a sign up around xmas that says Get Your Flu Shot. So, as you herd into the lot and park, and think about it, the Flu Season is soon upon us. Get the flue shot. WifeyPoo is on you to get your flue shot. Realo Drug Co. has a sign up for their shots. Walmart has some schmuck in there armed with syringes and needles. When we the Sheeple fall into step, the steps become a march. Wow , very strong opinions , some claiming or attempting to be in possession of absolute truth here , just like talibans..
That may be so but the liberals and tree huggers are not murdering people and detonating explosives in their opposition to vaccinations. Not so, Michelle. The imperialist policies of the US, and its sattelite agent state Israel, are directly responsible for the warfare responses that aoccur on a daily basis. If the colonists, aka terrorists to the British cause, in America had not been equipped with the equal battlefield means to wage war as they did, it is likely that more guerilla methods would have been employed. Either way there was going to be a fight seeing that the British sought to impose their political will on the colonies by measures beyond those the colonists could or would bear. Maybe you need to watch the movie The Patriot starring Mel Gibson to understand the nature of warfare. Yes Elaine, I read your article, sorry I didn’t reply to the specifics of it. Didn’t realize you had requested that and I didn’t feel as though it had very much merit considering that what its promoters were suggesting was that people needed to take additional doses of toxic materials more often in order to maintain a hopeful immune level. How long are those levels going to remain sufficient? Will the next step be increased or stronger vaccines being dispensed much like the increasing need for stronger antibiotics which has further operated to mutate bugs to the point that we are having a near crisis in handlling outbreaks of things such as MRSA infections for instance? How long must those of us who choose to live in accordance and harmony with the laws of nature be subject to the imposition of long term side-effects of unnatural materials by these unproven medical approaches? Why should we be the segment of society forced to forfeit our natural immunities just because vaxxers fail to immunize often enough? What is wrong with allowing the survival of the fittest to occur naturally among those who choose to rely on their natural immunity? Elaine, you know what I really like about the opposition I encounter on this comment board? I can count on them. I can count on them to never address my questions. BTW, did you watch the video I posted? Did you read the article that I posted a link to? “Part of the reason there’s been a resurgence in whooping cough is that the newer vaccine, which causes far fewer side effects than the old vaccine, doesn’t work for as long as the older vaccine did, the researchers explained. Because of this, it’s crucial that children receive vaccines and booster doses on schedule. If there’s a delay in vaccination, the risk of whooping cough goes up.
. Annie,, Elaine or any other pro vaxxer reading this. Do you have any logical explanation as to how the vaccinated are threatened by the unvaccinated if the vaccinations work? BTW, did you watch the video I posted yet? Thanks Dars for the info you made available. Gates is a Machiavellian idiot. Remember how scurvy was overcome. Proper nutrition is the answer if the conditions have not progressed to a state beyond repair. Nutrition must be understoood as the preventative approach. Keep your toxic vax to yourself. I prefer to build my own natural immune responses without the unatural aid of toxins. Do you know any logical rason why.unvaxxed people should be forced to do otherwise, especially if your vaccinations work? Dredd, You have a sick sense of humor..which I love. I had to get a vaccime after that show (V: The Evolution of The Vaccime). … Are you old enough to remember polio? One of the best burlesque shows ever. Babe costumed as Pinocchio doin’ the pole. if the shots are effective. with vaccine efficacy plague other vaccines as well. outbreak of pertussis, 4 of every 5 people who contracted the disease were vaccinated against it. United States; 92% of the cases were in people who were vaccinated against mumps. transmission rates are reduced may not apply to vaccinated populations. Vaccination and immunity are not synonymous. of people in the targeted population school children take them. unvaccinated children are a threat to the group. But this does not make sense. shots are somehow responsible for protecting the vaccinated. unvaccinated students risk contracting the disease. instead to smear the unvaccinated. Outrage should be vented in the proper direction at those who developed ineffective shots and falsely promoted a defective product.